FOUNTAIN OF HONOR, c.1930, designed by sculptor Henry Lion, on the grounds of the Ebell garden. Photo by Michael Locke. Get ready for spring planting and summer garden maintenance at the Hancock Park Garden Club sale and event Sat., March 4 at the Ebell Club, in the parking lot at Lucerne Blvd., from 9 a.m. to 3 p.m.
“Our goal, as a club, is to help gardeners. We will have natives and drought tolerant plants, the best tomato plants from Tomatomania. Absolutely wonderful daylilies and irises from Greenwood Garden. Orchids from Zuma Canyon Orchids and more,” said HPGC president Ginger Lincoln. Mark Donoforio from Tomatomania will speak on “All Things Tomato” at 10 a.m.
Lisa Novick, director of outreach at Theodore Payne Foundation, will talk at 11 a.m. on how native plants support butterflies, birds and other creatures needed in healthy food webs. For example, while Mediterranean non-native plants contribute to water savings, they may not be so helpful as an ecosystem support in Southern California gardens. John Schoustra, founder of Greenwood Gardens, will be available at noon to speak on creating easy year round color with geraniums, irises and daylilies. George Vasquez of Zuma Canyon Orchids will stop by at 1 p.m. to answer all your questions about orchids. Throughout the day, there also will be succulent and cactus vendors, linen purveyors, pottery for the garden from Black Mountain Ceramics and other home goods. Proceeds from the sale will benefit the restoration of the Ebell of Los Angeles Historic Garden. Visit hancockparkgardenclub.com. The following, by Caroline Labiner Moser and Sara Nitikman, is excerpted from The Ebell website. 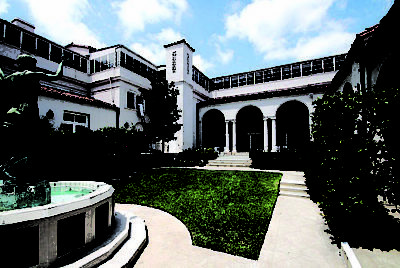 Yoch was commissioned to design the Ebell garden in 1927, the year the building opened. She designed the garden to be simple and elegant, and to contain areas where people could sit outside. VIEW OF FOUNTAIN from front. Photo by Michael Locke. The design was later expanded to include the fountain. 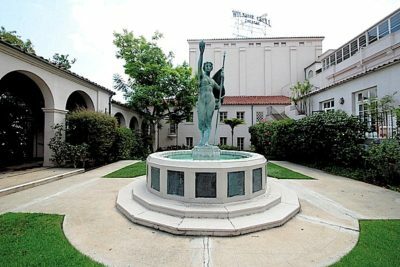 In 1930, The Ebell commissioned sculptor Henry Lion, who also designed the front doors to City Hall, to design a “Fountain of Honor” to be placed in the garden to commemorate the husbands, sons and brothers of Ebell members who served in the military during World War I.